Pottermore has released 2 brand new eBooks, Quidditch through the Ages and Fantastic Beasts & Where to Find Them. The two books are available for $3.99, and can be purchased from the Pottermore Shop. 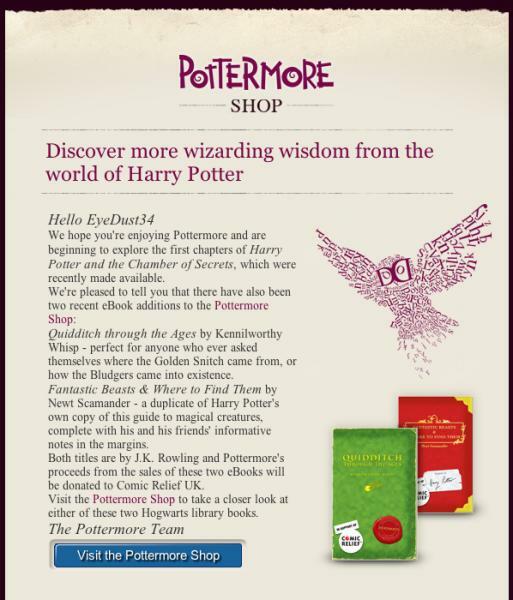 The Pottermore team has also sent an email to its users regarding these new products. Have you purchased anything yet from their online shop? Do you plan on purchasing any of these eBooks? Leave a comment and tell us! I will not be purchasing e books until later, as I do not yet have a kindle or e-book reader.